Well since my last post we have lost 2 members from my hubby Paul's family. Firstly his Uncle John passed away from a heart attack in hospital, after a few months of being unwell. Uncle John was a very quiet, intelligent man who was a school teacher and principal in his working life. He spent many of those teaching years in remote areas of SA. As he never married and didn't have children our boys used to like visiting him as little kids as he would have special ice creams and soft drinks in his fridge along with a pool table and cool computer games which were all treats back then. A week after we farewelled Uncle John we were shocked to the core with a phone call on 27th July from a family member advising us that Paul's brother Richard had experienced a sudden heart attack and had also passed away. Richard was 18 months older than Paul and a very fit and healthy guy which made this all the more surreal. This has been a really difficult time and it's still really hard to believe that it's happened. Richard didn't have children but has a beautiful wife, Caroline who as you can imagine is trying to adjust to life without Richard. His 'Celebration of Life' ceremony was a beautiful tribute to his 53 years of life. 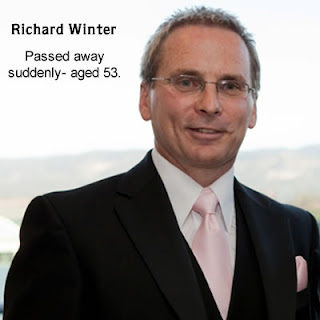 We had a good relationship with Richard as we do with both our families, which is always a peace of mind at times like these as we can cherish the memories and don't have any regrets. Love and prayers to all your family. Sorry to hear your sad news Annette, it's never easy losing family members.